The Piece Hall will host its first ever Wellness & Community Festival on 27 & 28 April; a free two-day event which will help the local community get active and creative, as well as offering much-needed support services. The Courtyard will host four different ‘zones’ for visitors to explore themed around Active, Creative, Support and Wellbeing. From fitness fanatics to first timers, anyone looking to get moving can try their hand at a whole host of sports including all-adapted cycling, kurling, dance, tai chi, wheelchair basketball and yoga, and also pick up some tips from Sport For All and Threeways Sports Centre. Visitors with a creative flair can try their hand at mindful colouring and stone carving, amongst other calming artistic activities. An array of Support services will be on offer across the courtyard from charities Basement Recovery Project, Healthy Minds and Samaritans, and there will be food pop-ups and music from community choirs and local musicians. Inspired by the contours and undulations of the local landscape, the public will be invited to collaboratively weave yarns and threads onto an interactive loom structure, building up natural elements through colour and texture. Visitors can add their own message of hope for Calderdale onto a range of surfaces, which will be incorporated into the structure as it grows. There’s good news for young people and adults with intellectual disabilities who are interested in sport. Calderdale Council, working with Yorkshire Sport foundation are offering some Special Olympics Taster sessions. The first Special Olympics taster session will take place on Sunday 7 April, 1.30 – 3.30pm at North Bridge Leisure Centre, where young people, adults and family members will have the opportunity to ‘have a go’ at several different sports which are included in Special Olympic programme. For further information on the Special Olympics programmes or other disability sports development initiatives, please contact Debbie Greenwood debbie.greenwood@calderdale.gov.uk 01422 341527. Disabled Living’s newsletter is always worth a read, covering a wide range of topics. Here’s a link to their March edition. Brand new lifts to both platforms at Hebden Bridge Railway Station are now installed and in service. Full access is now available on both platforms, and in both directions. 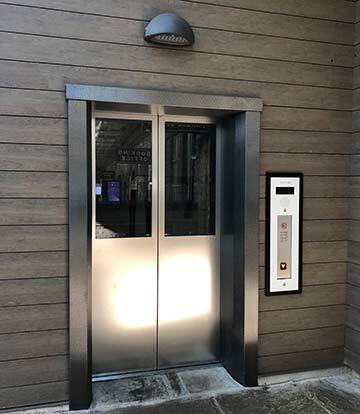 The lifts will benefit lots of different people including those using wheelchairs, scooters, pushchairs, bikes; those carrying heavy luggage or who have visual or mobility impairments. The lifts were campaigned for by Friends of Hebden Bridge Station and other members of the local community, including the Hebden Bridge Disability Access Forum. Hebden Bridge Disability Access Forum meet next at their monthly meeting on Monday 15th April, 2.30pm, in the Terrace Room, The Town Hall, Hebden Bridge. All disabled people who live in, work in or visit Hebden Bridge and the surrounding parishes are welcome to attend the meeting, or feel free to contact the group at sechbdisabilityaccess@gmail.com about membership.